The UC Davis Master of Science in Forensic Science is rooted in scientific concepts and methodologies. Students may choose an area of emphasis for the degree: Forensic DNA or Forensic Criminalistics. These tracks incorporate a comprehensive knowledge of biology and chemistry and an abundance of hands-on training in our facilities and labs. Courses in the forensic science department are held at the Forensic Science Center, located one mile east of the UC Davis main campus. To accommodate working professionals enrolled in the master’s degree, these courses are typically held in the evening. Most elective courses are held on the UC Davis main campus and at the CCI training facility near the UC Davis Medical Center in Sacramento. Elective courses outside of the forensic science department are held during the day, between 8 a.m. and 6 p.m.
Overview of forensic science—problem definition, strategies for problem solving, analytical tools, and professional and ethical considerations. Specific topics include the scope and history of forensic science; reconstruction of past events; the scientific method; scientific and legal concepts of evidence and proof; establishing unique connections using physical, chemical and biological foundations; reconstructing dynamic processes in terms of physical, chemical and biological aspects; recognition, collection and preservation of evidence; statistical considerations in evidence interpretation; heuristic considerations in evidence analysis; and professional standards, ethics and quality assurance. Introduction to optical and electron microscopy. Topics span microscopy and photography, including transmission, diffraction, reflection and absorption; polarized light and polarizing crystals; phase contrast and radiography; image recording and the various methods of processing and enhancement; scanning electron microscopy in the analysis of gunshot residues, paints and glass; EDS and XRF spectroscopic analysis and interpretation; and the boundaries of trace analysis including the significance of signal-to-noise ratios, and minimum detectable levels and homogeneity. Discuss, evaluate and interpret advanced molecular spectra/structure, Infrared Spectroscopy, such as chemical applications of spectroscopic methods, vibrational, rotational spectra; electronic spectra, photoelectron spectroscopy generated by various analytical instruments used in forensic science community. This class will focus on forensic toxicology as it relates to driving under the influence of drugs (DUID) investigations, and will provide students with an understanding of some of the analytical and interpretive considerations involved in the daily work of the forensic toxicologist. DUID detection and evaluation through the use of standardized field sobriety tests and drug recognition protocols will be covered, along with issues related to sample collection and drug stability. 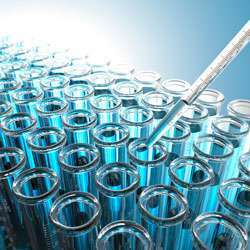 Typical scope of analysis and workflow will be covered, including presumptive immunoassay screening, sample extraction, confirmation using chromatography coupled with mass spectrometry, data review, and reporting considerations. This information will give students a strong foundation for employment in a forensic toxicology laboratory. An exploration of the analytical methods associated with the identification and quantification of ethanol in various matrices. Absorption, metabolism and elimination of ethanol in the body. Discussion of first order kinetics related to elimination for blood alcohol content extrapolation purposes. Common legal challenges associated with analytical results will be explored. 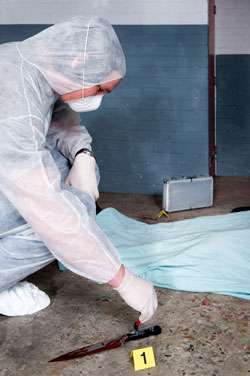 This course explores methods by which individuals may be identified using physical evidence from crime scenes and related events. Students will be exposed to a variety of identification methods and required to evaluate them by application of criteria of reliability, accuracy and usefulness. 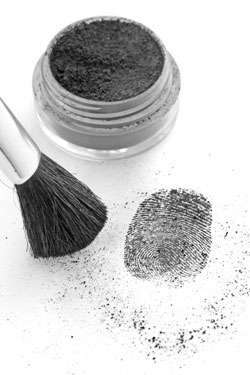 Students will develop an understanding of the value and reliability of methods of personal identification in forensic science. Explore the relationship between science and the criminal justice system. Admissibility of scientific testimony and documentary proof during the trial, concepts of relevancy, hearsay and opinion rule, examination of expert witnesses, impact of Kelley-Fry and Daubert decisions and court testimony will be discussed. This course will address principles and techniques of scientific investigation of fires and related crimes; offer peerreviewed protocols for processing fire and explosion scenes; discuss recognition, collection and analysis of physical evidence; and describe the scientific method for decision-making in fire/arson investigation. This course will instruct students on how to write clear, credible forensic reports and scientific articles, ones that (a) reflect well on them as professionals in the workplace, (b) meet their readers’ varying needs and interests, and (c) serve the ends of the justice system. Students will also learn the preparation and composition of scientific articles to be submitted for publication in forensic science journals. This course will present an introduction to the analysis of toxic chemicals, including the theoretical and practical considerations regarding the separation, detection and quantitative determination of toxicants by chemical and instrumental techniques. This course will cover methodology and instruments used for the analysis of substances of interest in the discipline of forensic science. Students will gain practical experience with modern instrumental techniques and methodologies used in the advanced forensic science laboratory. This course explores processing and evaluating complex homicide scenes. Functions and activities of police agencies are also covered, as well as recognition, documentation, identification, and collection of evidence; event sequence reconstruction; and evidence collection, preservation, report writing and courtroom presentation. Discuss the threats to the security of any kind of evidence that is captured, transmitted, or stored digitally and develop critical thinking and basic knowledge of computer forensic science issues in the evaluation of digital evidence. Introduction to basic statistical analysis, sampling and measurement uncertainty in forensic disciplines other than DNA. Students will use Ishikawa diagrams, calibration certificates, quality control data, descriptive statistics and confidence intervals for estimation of overall measurement uncertainty. This course will also include discussion of the most common analytical sampling plans as well as review of less common Bayesian methods. This course provides an overview of the principles of population genetics as they apply to forensic science. A strong emphasis will be placed on the theories and models of population genetics. Prerequisites: FOR 280 and 281 or permission of instructor. Review organization/function of the human genome, recent developments, next generation sequencing techniques including the preparation of DNA samples, principles of the new generation sequencing assay formats and biochemical reactions. Will include quality control parameter, and bioinformatic approaches. Directed toward those graduate students (and advanced undergraduates) who have some background in biochemistry, this course will familiarize students with a variety of basic molecular biological techniques/approaches, including how these techniques are used and what information they can provide. Examples of the application of these techniques will be taken from current scientific literature. This course provides a foundation in theory and practice of forensic DNA analysis; past, present and emerging technologies; legal and quality assurance issues. DNA extraction, DNA quantitation, multiplex amplification of STR loci, capillary electrophoresis of amplified products, and analysis of STR typing data are also covered. Lecture—2 hours; laboratory—3 hours. Prerequisite: FOR280. 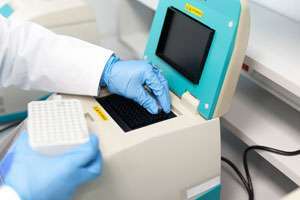 This course is designed to provide an overview of the principles underlying forensic DNA typing and will allow students to apply this knowledge in a laboratory setting using techniques to extract, quantify and type human DNA. This course provides an overview of the foundational concepts in forensic biology: chemistry and molecular biology of biological evidence, genetic basis of biological uniqueness, evolutionary basis of species differences, patterns and dynamics of evidence deterioration, and the legal/professional considerations associated with biological evidence. Offered fall quarter, alternate years. The objective of this non-human forensic science course is to provide a comprehensive understanding of plant and animal forensic biology in terms of sample collection, preservation, analytical methods and/or the invaluable lines of inquiry this forensic evidence may permit. This course includes a review of analytical instrumental methods in forensic science such as gas chromatography, gas chromatography mass spectroscopy, infrared examinations, UV analysis, atomic absorption, and LC chromatography. Review of drug analytical procedures, basic toxicology methods, and clandestine lab analysis is also included as well as a review of basic microscopy. The seminar series brings in renowned speakers in forensic science who will present subject matter important to all students. This is also the forum in which students are required to present the results of their thesis research. This course introduces identification, formulation and solution of meaningful scientific problems encountered in forensic science including experimental design and/or theoretical analysis of new and prevailing techniques, theories and hypotheses. Students will present their thesis research. Students are expected to complete 18 research units in their desired area of specialization. A thesis committee chair will guide students in shaping their thesis research plan. Current students: 299 units are to be used for your research only. If you plan to take research units in your first year, they should be under your graduate adviser’s name. As soon as you have selected a thesis chair, your remaining units should be under their name. Contact the staff advisor for your course registration number (CRN) for 299 units after you have received email approval from the faculty member from whom you will be taking the units. The following are examples of some of the courses available as electives. Lecture—3 hours; laboratory—2.5 hours. Prerequisite: 128C or the equivalent. This course provides an identification of organic compounds and the investigation of stereochemical and reaction mechanism phenomena using spectroscopic methods—principally NMR, IR and MS.
Lecture—3 hours. Prerequisite: 110A and 115 or the equivalent. Course topics include numerical treatment of experimental data; thermodynamics of electrolyte and non-electrolyte solutions; complex equilibria in aqueous and nonaqueous solutions; potentiometry and specific ion electrodes; mass transfer in liquid solutions; and fundamentals of separation science, including column, gas and liquid chromatography. Analysis of the way materials fail. This course examines the effects of temperature, mechanical deformation and corrosion on the properties of materials. 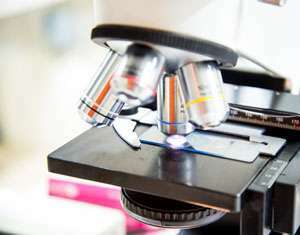 Forensics and methodologies for investigating failures of materials including optical microscopy, x-ray analysis and scanning electron microscopy, and investigation of practical problems are also covered. This course examines toxic chemicals, primarily pollutants, in the environment; concepts and techniques of sampling, detecting and quantifying toxicants; collection, interpretation and use of analytical data. This course has been approved by the California Department of Health as meeting the quantitative analysis requirement. Prerequisite: Textiles and Clothing 6 and Chemistry 8B. This course covers the structure, properties and reactions of natural- and man-made fibers; the relations between molecular structure of fibers and their physical properties; and interactions of fibers and detergents. Prerequisite: FPS161 (may be taken concurrently). This course teaches laboratory methods and procedures employed in qualitative and quantitative analysis of textile fibers and auxiliaries. Prerequisite: ETX220 (may be taken concurrently). This course teaches laboratory methods and procedures for the microanalysis of toxicants. Students learn to use chemical and instrumental techniques for separation, detection and quantitative determination of toxicants. Prerequisite: Biological Sciences 101, introductory statistics and calculus. This course covers segregation, linkage, and the mapping and the modifications of Mendel’s original genetic model. Prerequisite: GGG 201A or consent of instructor. Study the basic concepts of quantitative and population genetics including gene and genotypic frequencies, multiple factor hypothesis, phenotypic and genotypic values, heritability, selection, genetic variation, the detection of quantitative trait loci and evolution in populations. Experimental and analytical methods are also explored. Prerequisite: GGG 201A or equivalent (201B and 201C are recommended). Topics include: human genomic organization; genetic structure of human populations; positional cloning of genes for human disease, application of linkage, association, and haplotypes for human studies; quantitative trait loci analyses; integrative genetic studies of gene expression; DNA repair mechanisms in genetic disease; mutation analyses; epigentics in human disease; human mitochondrial DNA disease; gene manipulation and gene therapy. Seminar- 2 hours. Prerequisite: GGG 201A and consent of instructor. Topics of current interest in human genetics and genomics are discussed. Prerequisite: 219. This course examines evidence law governing the admission of scientific testimony and considers trial advocacy in presenting and attacking such testimony. Each student is required to make an oral class presentation and prepare a research paper dealing with a particular forensic technique. Limited enrollment. The goals of this course are to 1) explain central concepts of current human genetics; 2) illustrate how molecular and genomic approaches have revolutionized the practice of human genetics; 3) discuss the professional practice of human genetics and; 4) develop proficiency in reading primary literature and querying databases in human genetics. Prerequisite: Engineering 103 and 105. This course reviews chemical thermodynamics and chemical kinetics. Discussions include reacting flows, their governing equations and transport phenomena; detonations; laminar flame structure and turbulent combustion. This courses covers application of recombinant DNA technology to modern problems in biological, biochemistry and genetics, emphasizing molecular cloning strategies, choice of vectors, preparation of insert DNA and selection procedures.